I wish all of our destinations had a Rabbies - you're a complete pleasure to work with, have amazing product, and make things so easy for us! We've been able to increase our product portfolio in Scotland very significantly as a result of of our partnership - and plan on continuing to add more! "George Stewart is an absolute gem.. The pax loved him, and nothing is too hard for him. He is ideal for the older clientele group that Odyssey take"
I just returned from a great 4 day trip to Scotland! Mack was our guide and was amazing! I've been a travel agent for 25 years and have travelled a lot and have never had a guide this great! I'm sure all guides at Rabbie's are fantastic but Mack spoiled us and was extra special! His knowledge of Scotland along with the love he has for his country just made it all that much better! AND he sings and tells great stories! I will use this company again for my clients without a doubt! THANK YOU!!!! I like the company spirit, friendly staff and good will to serve us as good as possible without promising impossible services! I was the academic leader on a four-week history study tour through the Northern and Western Isles of Scotland in September 2013. I was working through a UK agent who subcontracted the final sections of the tour to Rabbie's. I meant to be in touch much sooner to express my thanks and appreciation to Rabbie's as a company and to our two drivers, Paul and then Karen, in particular. Each in their unique way contributed so much to our group’s enjoyment of our study tour. They were a credit to the company and certainly amongst our group there was a positive request to use Rabbie's when possible for future tours. Paul’s wealth of tales, knowledge of the islands such as Skye, sense of humour and "wee detours" are legendary – and his Scottish pride and yet patience with a Sassenach tour leader were much appreciated! Karen, too, endeared herself to the group and the fact she had spent time working in New Zealand also gave her a special rapport with members of the group. Our day together on the Isle of Arran was especially memorable. On Sunday I am giving a public talk on "Highlights of the Hebrides" and Rabbie’s will get a special mention. Just wanted to say thank you for working with us during expo. Eric was great, a lovely gentleman with a wonderful singing voice  THANK YOU ALL FOR BEING SUCH A GREAT COMPANY TO WORK WITH! I look forward to receiving your invoice soon. Rabbie's is a multi-award winning tour operator recognised as Europe's "Outstanding Example" of a sustainable and responsible tour operator at the Vision European Sustainable Tourism Awards (2011 at ITB in Berlin). We offer our extensive expertise to the professional travel trade and provide ground handling services in Scotland and throughout the UK and Ireland. We provide tailor-made services as well as off the shelf travel experiences. Our experienced and attentive sales team are only a phone call away from ensuring your customers have the holiday of a lifetime. If you are not registered, please contact us and we will provide you with a Username and Password. We’ve been delivering ‘small group tours’ since 1993 and in that time we’ve become recognised as the best at what we do. We believe that our small group tours give you more. More personal attention, more time with the locals, more time off the bus, more time on the back-roads and just more of an all-round enriching, memorable experience. Our scheduled small group tours range from one day, half day and City tours to 17 day travelling extravaganzas across Scotland, Northern and Southern England, Wales and Ireland. We offer our tours to the professional travel trade at discounted NET prices, making it a flexible and attractive product to be packaged with other services. Guaranteed Small Group Tours! Touring with no more than 16 passengers gives your customers more. Rabbie’s is committed to delivering unique and enriching tours, with stories to share and memories that will last a lifetime. Guaranteed Departures! Simple and straightforward! We do not require minimum numbers for any of the tours. You book, your client will travel - guaranteed. Rabbie's has been extending its programme, developing a new range of products and experiences exclusively for the travel trade, adding to their award winning programme of small group tours and travel experiences. We have developed innovative city break packages, ad hoc and series touring programmes and travel experiences for groups and individuals in the UK and Ireland. This has marked a new step in our business development, with Rabbie's having broadened its range of products and experiences, available to Travel Trade partners, both existing and new. Our longstanding and experienced sales team are happy to deal with any request, for individuals as well as groups. From 2 to 200 pax, we will find the right programme at the right price for you. 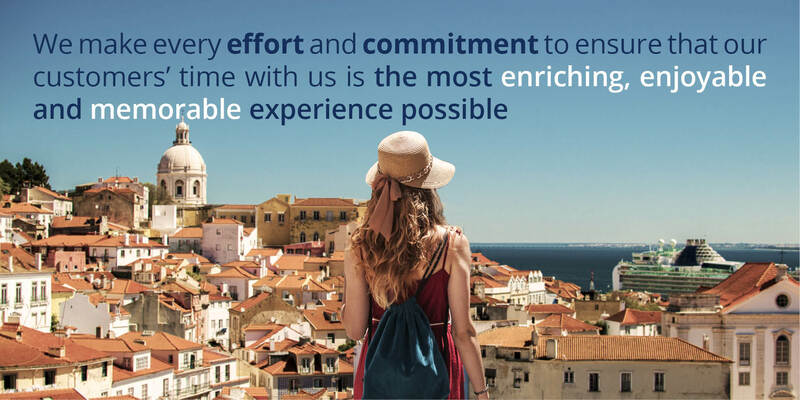 From leisure travel around UK & Ireland, to special interest group travel, company days out and conference programmes, we are here to help with local advice and experience. All accommodation providers used by Rabbie’s are handpicked for their quality, value and friendliness. We work with a range of properties - hotels, inns, guest houses and some high end B&B properties. Choosing the right accommodation is key to making your customers time in the UK & Ireland memorable. All our programmes are flexible and we are happy to tailor quotations for you accordingly. Any small group tour you see in our website can be quoted on an exclusive basis with a private driver guide. Would you like to take over a tour and add a language guide for your customers – no problem. Any self-drive programme or city package can be put together for a group. Let us know your requirements and we will create a proposal for you. We can arrange and organise environmentally aware, socially responsible tour programmes and transport logistics for conferences of any size. We have significant experience in providing transfer and shuttle services for delegates arriving at airports and train stations throughout the country. Designed for the conference and event organisers, we can white page our award winning tour programme into your website. Everything is managed by us from the design and presentation of our tours on your website to delivering the tours to conference delegates. Tours are available for delegates and partners; pre, post and during meetings and conferences. Rabbie’s promise to customers is to get them in touch with the people, places, history and legends, delivering unique and memorable experiences to last a lifetime. All materials © Rabbie's Trail Burners Ltd.
Materials may be used at Rabbie's Trail Burners Ltd's discretion for online and printed promotions of Rabbie's Trail Burners Ltd's products. Rabbie's Trail Burners Ltd., 6 Waterloo Place, Edinburgh, EH1 3EG Scotland. Company registered in Scotland no. SC164516 at 6 Waterloo Place, Edinburgh, EH1 3EG.